You probably own shares in a mining company or oil producer. But have you thought about investing in commodities themselves? Few people do. It used to be the realm of major institutional investors or billionaires trying to corner the silver market. But these days investing in commodities is very easy for anyone. In fact, there are so many ways to do it that the choice can seem overwhelming. You need to make informed decisions about how to invest as well as which metals to choose. The chart below tells you now is the best time to invest in commodities going back almost half a century. Quite frankly, it’s the opportunity of a lifetime. The chart shows the value of a commodity index divided by the broader market. Specifically, the Goldman Sachs Commodity Index (GSCI) divided by the S&P 500. When it’s high, commodities are expensive compared to the stockmarket. When it’s low, commodities are cheap. As you can see, it’s at the bottom of the range. A surge in commodity prices is a good bet based on mean reversion – a return to historical average. The last time we were here, the ratio turned upwards on a long bull market. The GSCI quintupled. In 1971 it did the same. When commodities move like that, it creates an extraordinary stockmarket boom too. During the boom that began in the late 1990s, BHP Billiton’s London share price went up tenfold. Rio Tinto’s quintupled alongside the commodity index. And these are the major producers. Their share prices are supposed to move slowly! Small cap stocks handed investors far bigger gains. Pick the right minnow and your stock can go from less than a cent to almost $12 as Fortescue Metals did in Australia. Randgold Resources went up tenfold on the London Stock Exchange (LSE). If you want to bet on a commodity boom, there are a selection of ways to do it. Buying the physical commodity is just one way. You might invest in exchange-traded funds (ETFs) that hold resources. Or perhaps a basket of the world’s leading commodity companies. You could pick the individual companies you like most and buy their shares. Some offer fascinating opportunities. Gold is a precious metal, not an industrial one. Its value comes from an extraordinary history as money. Unfortunately, pretty much the opposite is true in the short term. Gold has become a financialised asset. Its price is heavily manipulated in the futures market and few in the mainstream financial world acknowledge its power or history. Despite this, gold dramatically outperformed stocks between 2000 and 2010. You can see how the gold price (in gold) rose more than silver (in silver) and the two major American stockmarket indices (in blue and red) below. Not bad for an inanimate lump of metal. The gold price’s future is a question of instability elsewhere. Gold doesn’t change and is independent of everything else in the world. It’s just a lump of metal. But if you expect money to devalue thanks to inflation, or the financial system to go into a crisis, gold offers the ultimate protection. Silver offers many of the benefits of gold, with some added twists. It’s a precious metal as well as an industrial one. The demand splits down the middle. The history of Britain’s money is very much connected to silver rather than gold. Our very currency bears its name thanks to pounds of sterling silver. Silver is also important to the industrial world. Its ability to conduct heat and electricity go alongside anti-microbial properties. If you think of a list of booming industries thanks to new technology, it’s a safe bet they need a lot of silver. From batteries and solar power to microchips and medicine, silver is crucial. The price of silver is far more volatile than gold and open to more manipulation. The Hunt brothers famously tried to corner the silver market, for example. This means the short-term price of silver is an unreliable indicator of trends. Silver is for investors with a strong stomach who can handle volatility. But if you can, outsized gains are possible. Check out this very long-term chart. It shows the relative performance of gold and silver (in their relative colours) compared to stocks going back almost 50 years. The S&P 500 and the Dow Jones Industrial Average are in blue and red. After leaving the gold standard, the inflation of the 70s in the US made gold and silver surge. Equities caught up in the 90s – keep in mind the chart doesn’t include the tech bubble’s NASDAQ stockmarket index. The 2008 crisis saw gold outperform and silver followed with a dramatic surge in 2012. After that, gold and silver both fell. But the real lesson here is how undervalued silver is. You can play with the timeline on the Longtermtrends website to change the results of the graph dramatically. But it’s clear that gold, silver, and the stockmarket cross over back and forth. At the moment, gold and the stockmarket seem to be meeting in the middle. But silver is the clear laggard, since 2012. Silver looks undervalued. Is this an incredible buying opportunity? Either way, the chart adds to the commodity boom story above because silver is both an industrial and precious metal. Its undervaluation is a sign of commodities generally being undervalued. Palladium is an extremely important industrial metal. Its uses are split between automotive and industrial, with a small amount of jewellery and investment demand. Palladium was the best performing commodity of 2017, up 55% as inventory at the New York mercantile exchange hit long-term lows. Environmental standards for cars, the Volkswagen emissions scandal and China’s consumer boom mean major companies have been sucking up vast mountains of the stuff. The price even surpassed its sister platinum for the first time since 2001. If you like the idea of trading political risk, consider that about 80% of palladium and an even higher share of platinum are mined in just two countries – South Africa and Russia. Neither are making political headlines for good reasons right now. Another interesting trait of the palladium market is its connection to platinum. According to the news site Fin24, platinum miners have slowed their efforts in recent years due to flat or falling demand for platinum. A lot of palladium is mined in conjunction with platinum, reducing the supply despite growing demand. It’s an odd situation where supply and demand can remain out of whack, leading to higher prices. Palladium’s surge came at platinum’s expense. But as you’ll discover, this could make it an imminent buying opportunity. While diesel cars tend to use platinum in their catalytic converters, petrol cars usually use rhodium and palladium. The Volkswagen emissions scandal delivered a sudden dramatic change in demand as people abandoned diesel for petrol as fuel. The price divergence in the corresponding commodities was quick. Platinum prices tumbled while palladium surged. 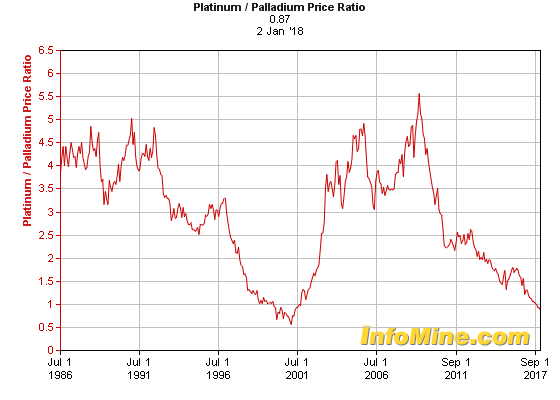 This chart from InfoMine shows the platinum to palladium ratio. When the line falls, palladium is expensive relative to platinum. That means platinum is at its cheapest since 2001. The platinum price has now stabilised at financial crisis lows. So there’s no question platinum is cheap and undervalued. But will it go up? You have to look at supply and demand. Platinum is a bit like silver, but far less popular with investors. Its uses are about evenly split between the automotive, industrial and jewellery industries. Platinum jewellery is growing in popularity in Asia especially. Platinum is rarer than gold and far less of it is mined. While platinum output from the key producer South Africa has fallen 25%, the stockpiles of platinum have fallen for five years in a row too. That means demand has outstripped supply for a long time now. About $10 billion in platinum is bought up every year. At some point, this demand will trigger a price surge while supply remains hampered. So how do you invest? Investable coins do exist. But the market is far from liquid. You can expect large premiums. The precious metals investment provider BullionVault estimates the total cost of investing at 34-47%, including the spread demanded by dealers and the 20% VAT. That’s prohibitive. The platinum ETF, ETFS Physical Platinum [LSE:PHPT] is a good way to play any coming surge in platinum. More using ETFs below. Unfortunately, finding stocks that mine platinum as a major part of their operations is difficult. We’ll look into that below too. Rhodium is another platinum group metal (PGM) alongside palladium. Its price performance and uses are similar to palladium. The price doubled in 2017 to a six-year high after finishing 2016 with a 12-year low. Back in 2008, rhodium hit $10,025 an ounce before falling 90%. Volatility is quite high in commodities like this. And it’s easy to see why – 80% of rhodium is mined in South Africa. Rhodium’s price recovery owes much to the Volkswagen diesel emissions scandal too. Like palladium, rhodium tends to be mined with platinum. The proportions that platinum group metals miners extract are around 60% platinum, 30% palladium and 10% rhodium. Just a few years ago, Chinese authorities were dealing with an odd sort of theft. People were stealing manhole covers to meltdown the metals inside and sell them for scrap. In 2004, Beijing officials estimated 240,000 were stolen in the city alone. And the practice quickly spread around the world. It resulted in a lot of funny accidents too. Currently, the price of copper is around the World Bank and Goldman Sachs estimate of $7,000 a tonne. In November of 2016 it surged to a 3.5-year high when Chinese imports jumped unexpectedly. The question is whether this trend can continue. And this is largely dependent on demand out of China. More on that below. What you need to know about copper is its position in the world economy as a sort of barometer. They call the metal Dr Copper because it has a PhD in economics from the University of Real Life. 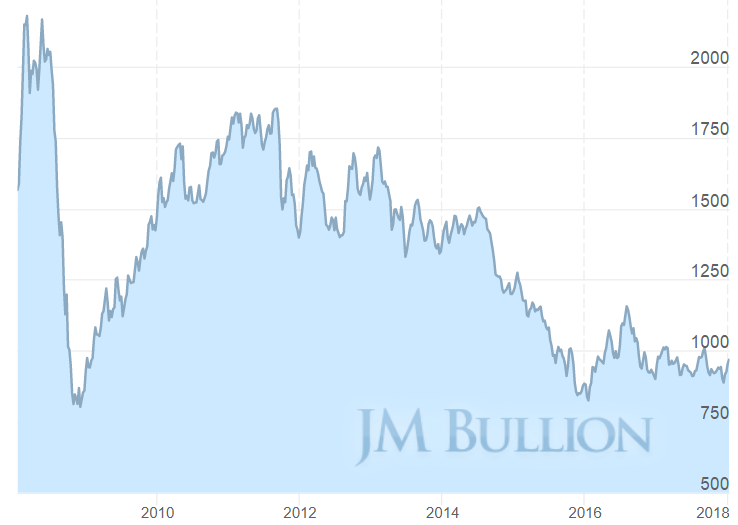 The copper price indicates economic conditions because it’s so widely used in so many ways, including in sectors of the economy that are leading indicators, like construction. These days, Dr Copper also specialises in electric cars because they use up so much of the metal. Investing in copper via ETFs is particularly easy. There are even leveraged options. The main ETF is ETFS Copper [LSE:COPA]. The sales tax applied to investing in metals is a potential game-changer. Paying a 20% premium can ruin your investment’s potential. The good news is that gold is exempt, as long as you keep it as an investment. The other precious metals, on the other hand, carry a 20% VAT. Unless they’re stored in a bonded warehouse outside the EU. That means it’s possible to own silver VAT free, as long as it remains out of your possession and the EU. Hence the popularity of Switzerland and Singapore as precious metals storage locations. Generally, capital gains tax (CGT) applies to your investment profits in metals. But when you buy certain precious metals coins, your gains could be CGT exempt. This is because some coins are classed as legal tender, much like the pound coins in your pocket. However, this exemption only applies to certain coins. These include silver Britannia coins, gold Britannia coins and sovereigns. Each class has dozens of variations in minting year and weight. I wonder if you’ve spotted the blind spot that gets people into trouble. Silver legal tender coins may be CGT free, but they aren’t VAT free. There’s nothing like holding a precious metal in your hand. It’s the most direct form of ownership of something very valuable. Even ownership of your home is subject to the land registry. A friend once told me that in Bulgaria, you can pay a gypsy to climb through a window into the Bulgarian property registry and change the name on certain key documents. Your business competitor will wake up to discover their shop now belongs to you. And the legal process of correcting the documentation takes many years. Anyway, owning physical precious metals directly is an excellent way to diversify your wealth out of the financial and political system. It also introduces new risks though. Like the risk of theft. But that’s the point of diversification – to reduce total risk by mixing up which risks apply to different sections of your wealth. Unless you’re like me, it’s unlikely everything will go wrong at the same time. The problem with physical metal investing is the cost. Storage, insurance, transactions and taxes all add up. For platinum coins, for example, BullionVault estimates the costs can come close to 50%. That’s prohibitive. But there are many solutions. If you trust firms like BullionVault to keep your metal safe in places like Zurich and Singapore, they’re a wonderful option to own physical metal. And outside the UK government’s reach too. But if you want to own coins in your hand, the options drop fast. The cost of owning all but one metal make the venture too expensive. Only legal tender gold coins are widely available enough and tax exempt enough to be worthwhile. Silver coins come close. Gold bullion can be a good option too, but why give up the CGT exempt nature of the right coins? The caveat worth considering here is the odd opportunity you might have to buy precious metals from unusual sources. Silver offcuts from industrial uses, for example. Or buying old jewellery. These are perfectly legitimate ways to invest in precious metals. Actually owning commodities has always been a pain for individual investors. And our pain is the institutional investor’s gain. Goldman Sachs is famous for its shady warehouse dealings to manipulate markets. If you want to own the physical metal, premiums above spot prices are enormous. And the price of many metals fall well short when you try to sell. So what about using the financial markets’ remarkable ability to get you access to any investable trend? What about metals ETFs, which are usually known as exchange-traded products (ETPs)? The LSE’s palladium ETF [LSE:SPDM], priced in pounds, looks much the same. So it’s certainly possible to profit nicely from the metals themselves without getting near them. Medium-term trading these ETFs is a great option. But don’t buy and hold for too long. The fees eat into your returns. And they are really just an investment in a lump of metal which doesn’t change. If you want to dramatically grow your initial stake, there’s a better way to invest in metals. Most commodity speculators prefer stocks. And yes, if you’re investing in commodities, you’re almost certainly speculating. The cyclical nature of the business rarely makes “buy and hold” the way to go. Let’s take a look at what palladium’s price surge did for stocks. There aren’t many palladium-focused miners. Most of the stuff is mined by major diversified companies. But picking the right stock can generate extraordinary gains. Ivanhoe Mines’ share price rose seven-fold since 2016, for example. The risks in the small-cap commodity space match the opportunities. But that doesn’t mean the risk-averse investor need look away from commodity stocks altogether. That’s the mistake of institutional money according to one investment legend. He says larger commodity stocks are very much out of favour. The S&P 500’s exposure to energy and metals companies has dropped by more than 50% over the last few years, and the same is true of the MSCI All Country World Index. Those investing with a value bias may be particularly underexposed to resource equities, as value managers tend to be especially averse to the risks posed by commodity investing. When valuations relative to the market have been in the cheapest quintile of history, the commodity producers have outperformed the broad market by almost 7% per annum over the next five years on average. Given that valuations continue to hover around all-time lows, at this time resource equities are firmly entrenched in the cheapest quintile of history relative to the broad market. A commodity price boom generating 7% outperformance for commodity stocks sounds rather juicy. It could deliver the mean reversion in the chart we discussed at the top of this article. Grantham also claims that the volatility of commodities and commodity stocks keeps many institutional investors away. Pension funds can’t stomach a plunging oil price, for example. This only enhances the eventual returns for those who can hold on. Ordinary investors like us. But you still have to stomach the volatility. The point here is that the commodity scene is ripe and the potential gains very large. The best commodity investments are stable, undervalued and diversified miners. That way you’re most exposed to commodity prices, and least exposed to issues like political risk, management risk, funding risk and many others. But don’t expect sudden gains from these behemoths. Glencore [LSE:GLEN] and BHP Billiton [LSE:BHP] are two of the biggest miners in the world. They’re very diversified in a multitude of ways and stable companies that provide great exposure to commodities. Gold and silver miners listed on the LSE tend to come with political risk. Gold is found in volatile countries in Africa and Asia. But there is one excellent option. Fresnillo [LSE:FRES] is the largest gold company on the LSE by market cap and revenue. It’s also the world’s largest silver miner by a long way, and other industrial metals feature as major parts of Fresnillo’s business too. Operations are mostly in Mexico and the company does its own exploration. As for more speculative stock picks in the commodity world, including the PGM miners, you need to proceed with caution. These picks are volatile and time sensitive. But the LSE is home to the world’s third largest PGM miner. Lonmin [LSE:LMI] has been operating for more than 100 years now. It produces almost 700,000 ounces of platinum a year. Palladium, rhodium and other PGMs feature too. Proving the point that you need to proceed with caution, Lonmin’s share price is down 98% from 2012, with a takeover deal in the works. There’s a major risk to investing in commodities which you can’t overlook. It’s called China. On the one hand, China is the source of vast commodity demand. Its urbanisation, infrastructure boom and consumer boom implies a voracious appetite for all sorts of commodities. This chart from the Reserve Bank of Australia shows the proportion of trade and consumption which accrues to China across various commodities. China imports over 60% of the world’s iron ore and consumes over 60% of the world’s copper, for example. But this also means a small hiccup in China would leave commodity markets routed. Commentators are worried about a recession or debt crisis at the moment. Other economies went through plenty as they developed. But none were anywhere near the size of China. If China goes into crisis, commodities will be in trouble. What’s your take in the metals market? Leave us your comments below.